“DVCATVVM ESTONIA et LIVONIAE, TABVLA cumcursu Fluvii Dwiniae“, copper engraving published in St.Petersburg in 1745 by Joseph-Nicolas De l’Isle. Original hand colouring. Size: approx. 50 x 58 cm. From the Atlas Russicus, the first complete printed atlas of Russia. Joseph-NicolasDe l’Isle, younger brother of Guillaume De l’Isle, was invited by Peter the Great to survey the vast empire of Imperial Russia. The enlightened Tzar also invited De l’Isle to found a school of Astronomy in St. Petersburg, and although Peter the Great died a year before De l’Isle arrived in St. Petersburg in 1726, he was successful in achieving both of his Imperial commissions. Together with his partner Ivan Kirilov they founded the school of Astronomy and began the immense task of surveying the Russian Empire. 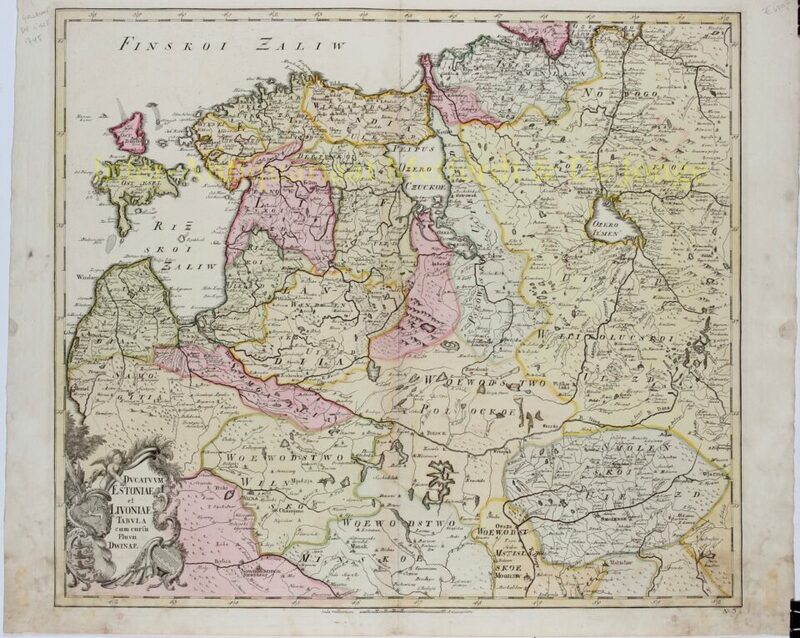 Eventually the two men parted company and Kirilov decided to publish his own incomplete atlas of Russia in 1734, eleven years before De l’Isle’s French team finished its more comprehensive work. On his return to Paris in 1747, De l’Isle was able to construct his own observatory in the palace of Cluny, the same observatory later made famous by French astronomer Charles Messier.